Many of us know Ray Grasse’s work: he’s written two books on astrology and his writings frequently appear in astrology periodicals and in anthologies. Under the Sacred Sky is a compilation of sixteen articles (plus two interviews) over the past twenty years that have appeared mostly in The Mountain Astrologer and in Dell Horoscope. These articles include material on the philosophical implications of astrology, some of the practicalities of the consulting astrologer-client relationship, and a lively dose of historical and mundane astrology. It also includes an interesting article on astrology and the chakras. 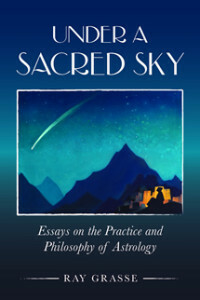 Under the Sacred Sky demonstrates the author’s strengths as a modern counseling astrologer and writer of astrology. His mind moves naturally toward expressions of symbolism, astrological or cinematographic or literary. His approach to clients appears humane and open-minded. If his conversational style is similar to his writing style he is a very good communicator. I recommend Grasse’s book for people who have a good working knowledge of astrological symbolism and who are interested in applying astrology to today’s popular culture, and to large and short-scale historical trends. Under the Sacred Sky gives a good introduction to these topics and I regard it here also as an invitation to a conversation or many conversations. In many ways this work represents a mainstream of contemporary astrology. Grasse’s approach is mostly psychological and archetypal, he focuses on outer planet symbolism as it applies to history and daily life, and he’s very interested in shifts in humanity’s consciousness from a Piscean to Aquarian Age. Like most modern astrologers his political worldview seems liberal and like most American astrologers he focuses a little too much on the United States. Although Grasse doesn’t burden the reader with discussions of astrological technique, he uses modern outer planet rulerships and correlates planets, signs, and houses within the Twelve Letter Alphabet as the lingua franca of today’s astrologers. When Grasse approaches the foundations of astrology, he weaves together themes of interconnectedness, synchronicity, and symbolism. He suggests a-causal links between things and objects and events that seem disconnected; he notes Jung’s depiction of synchrony as a rare event prompted by psychological need and suggests that an astrological view makes synchronicity ever-present in the universe. An astrological mind is a symbolic mind that is able to find the connections within areas of “objective reality” and to find “meaningful coincidences” that lead us to greater understanding and effectiveness. Using a sense of time larger than our ordinary notions takes us close to the heart of astrology. I add that in ancient and medieval thinking, time manifests through the orderly cyclical motions of the planets, and that astrological discourse is about events of this world and in our lives as they lean toward order and harmony. The ecliptic and celestial equator, the keepers of time and the organizers of astrology’s cosmology, made up the “Soul of the World.” As we get closer to divinity we move beyond the realm of astrological discourse and its cosmology into timelessness. We also need to factor in the consciousness of the artist, the astrologer – what is the contribution of the symbolizing mind itself to the reality of meaningful coincidences? When we look at cyclical time embodied in the motions of the planets relative to each other and to the planets as they move in the zodiac, we can look how they symbolize changes in human history and consciousness. Grasse’s depiction of Precessional Ages (he doesn’t call it that) gives us an opportunity to do this. There’s the general question of whether human consciousness has progressed throughout the few thousand years of recorded history that would include Ages of Taurus, Aries, Pisces, and (now or later) Aquarius. Over time our human environments have changed, becoming more interconnected, full of human artifact and knowledge and culture, and better able as a species to move beyond the mechanics of survival. A look at today’s news (on whatever day you are reading this) demonstrates clearly that all these factors are fragile. History shows the progression of the human environment, not necessarily human consciousness. Given enough environmental change we all become Paleolithic – and I admire much from our Paleolithic ancestors. Grasse’s depiction of the Piscean Age solely relies almost exclusively on Christian symbolism and I ask how other forms of spirituality also show Piscean attributes. I would also consider Christianity’s focus on universal redemption and the hero as world redeemer, since we also find this in other religions whose beginnings coincide with the rise of Christianity. Perhaps world redemption is the sunnier side across from these religions’ tendencies toward absolutism and intolerance. This focus on redemption shows no signs of abating. In contrast to Piscean absolutism, Grasse argues, we can see the transition to an Aquarian Age through the advent of democracy and the arrival of mass technology like the internet. Looking at democracy in its many forms historically and today in the United States and around the world, I see fragility and vulnerability, not a global growing trend. It’s also hard to quantify the relative impact of various technologies upon a society; I don’t know whether today’s internet or the ancient road systems (and other engineering breakthroughs) has greater consequence to their respective cultures. I’m not convinced that today’s movies – the main medium through which our culture tells stories today – illustrate a transition between Precessional Ages. Film is a secular medium and usually its depiction of religion falls flat. (I’m still waiting for the Hollywood biopic of Thomas Merton.) However, Piscean redemptive themes, if we wish to call them that, are alive and well and pervade the products of the film industry. Even if we are in the midst of a transition between Ages of Pisces and Aquarius, one shouldn’t get so excited. What follows an Aquarian Age is the Age of Capricorn! Perhaps Processional Ages do not depict humanity’s progress after all. Under the Sacred Sky contains technical articles on stelliums and planetary stations. Both articles contain examples of good mundane astrology and I would recommend them to the interested reader. Grasse’s linkage of the planetary lineup of 1962 with the events of late 1963, including trigger points, strikes me as brilliant. I’ve always wanted to approach mundane astrology with humility. The meaning of today’s news, like today’s emotions, seems so obvious and complete at the time but they often miss the larger picture and conflicting realities elsewhere. I sometimes wince when I read mundane astrology from old astrology books not because the information is inaccurate but because of the selective bias it shows. Many of us learned and practiced astrology using standardized symbol correlations that are actually recent in their development. My education first depicted each sign of the Zodiac with one planet as main or domicile ruler and this included outer planets as sign rulers. The meanings of Scorpio, Aquarius, and Pisces became very much like that of Pluto, Uranus, and Neptune respectively. Additionally, each sign and planetary ruler corresponded to one of astrology’s houses, so that Aries-Mars-First House formed one unit and so on until we reach Pisces-Neptune-Twelfth House. This is commonly called the “Twelve-Letter Alphabet”. These patterns inform the astrology of some of the world’s best astrologers, since this is what they first learned. Grasse uses this pattern and it seems to give rise to problems as it has for others. One difficulty – and I’ve written about this elsewhere – is depicting the sign Aquarius using attributes that properly belong to the planet Uranus alone. Aquarius, the fixed air sign, seems ill-suited to the role of revolutionary (reformer, yes) and of having energy that is spontaneous and unpredictable. The transpersonal range of Neptune and Pluto become limited when Neptune is about footwork and prison and Pluto about sexuality (and Venus, where sexuality should be, is given instead as the planet of wealth). At the same time Pisces is rendered as a sign that is more spiritual than others. It seems instead that each sign has a different potential to manifest spiritually. Partly because of my own background, Grasse’s depiction of the seven chakras and seven planets made for riveting reading. For planetary assignments, the root chakra aligns with Saturn and then they follow in the descending order of the planets, with the Sun and Moon the two highest chakras. I have usually seen solar and lunar energies depicted in the side channels, and I wonder about the respective placements of Jupiter and Venus, and this would make for interesting conversation across a dinner table. It seems that trouble begins when Grasse superimposes the signs of the zodiac around these planets and chakras, first using the traditional model and then using outer planets. The root chakra of the earth element thus becomes aligned with Capricorn and Aquarius and then he replaces Saturn of Aquarius with Uranus. Then he tallies the sign placements in a natal chart and then aligns those with chakras. Thus a prominent Neptune in Capricorn would be consigned to the root chakra, Moon in Leo much further up. Quickly a straightforward system has become counterintuitive and that’s dangerous for any symbolic system. Not every astrologer will agree with Grasse’s approaches or my responses to them, and there are many legitimate questions to ask about all these issues. My copy of Under the Sacred Sky is filled with brackets and underlines, circled sentences and phrases, short comments, question marks and asterisks in margins. This is a good thing. Astrologers, like many others in these times, have used new expanded means of communication to talk past each other and keep to their own bubble chamber. It does not need to be this way for there is much to talk about. Under the Sacred Sky helps launch this conversation.